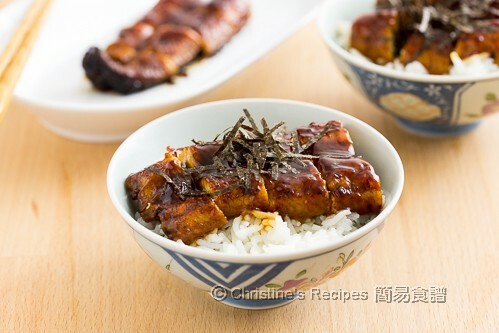 Whenever I dine out in the nearby Japanese restaurant, I would definitely order Unagi Don (Eel Rice Bowl) besides sushi. 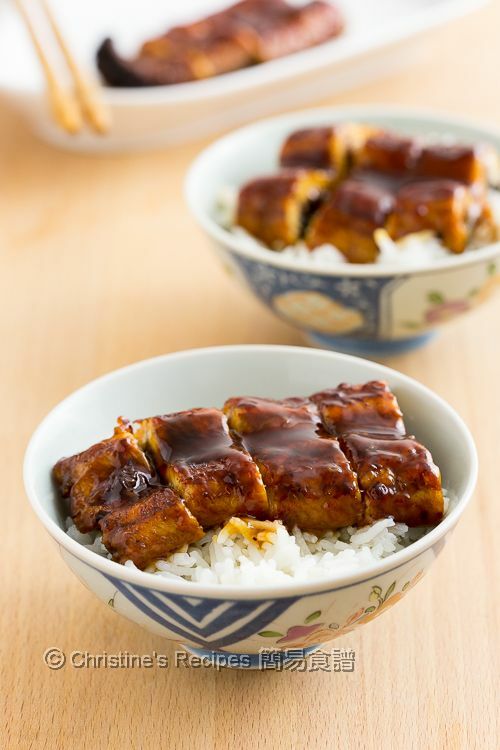 The sweet sauce, dressed on top of the fish, is addictively good, just like teriyaki sauce. I don’t want to miss a bit of it literally. The rice absorbs some of the sauce, making the whole dish so flavoursome. To make this dish, it’s very simple and quick. The whole cooking process only takes about 10 minutes or so. This is a keeper for any hectic days. Use a small pot, combine all sauce ingredients, except the potato starch and water, and cook over medium heat, until the alcohol smell is evaporated away. Combine the potato starch with water, then stir in the sauce. Cook until it’s slightly thickened. Remove from the heat. Set aside. Place the eel on a lined baking tray. Evenly drizzle about 2 tablespoons of sauce on top. Place the baking tray on the upper rack in the preheated oven. Bake for about 8 to 10 minutes. Don’t let it get burnt anyway. When the eel is heated through, it’s done. To serve, cut into smaller pieces and place on top of rice. Add roasted seaweed for garnish if desired. Absolutely delicious! The Eel (unagi) is already cooked and comes in vacuum-sealed package, kept in fridge or freezer at Japanese or Asian markets. 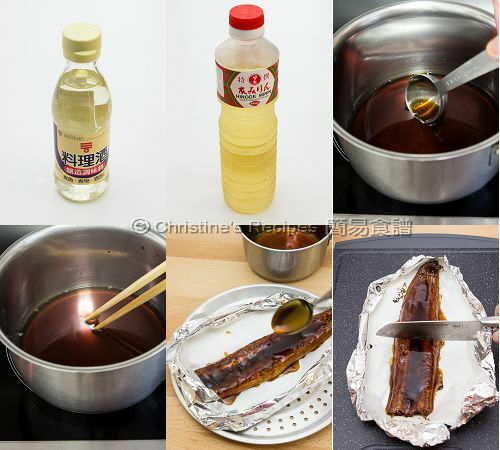 All you need is to heat it through and let the unagi absorb more flavours while grilling. As the sauce contains sugar, it’s easily burnt. Pay close attention while grilling. The remaining sauce can be used to cook chicken or other fish, like cod. It’s very delicious too. Mirin is a Japanese condiment with a very light sweet taste and low alcohol content, available at supermarkets or Asian grocers. (See the picture of mirin here.) It helps develop a glossy look for the sauce. The alcohol will boil away after heating. Yummy. I love teriyaki sauce and this sounds so delicious too. Have to look for that mirin. I really like to cook and collecting easy to do recipes. If you love teriyaki sauce, you'll love this dish too. Good luck to your searching for mirin. It's one of my favorite Japanese food too! Thanks for sharing! Thanks for dropping by, Jessie. Can't even remember when I last had eel...this is so delicious! Same here, Angie. So made it to ease my craving. No way this is ready in 10 minutes! This looks delicious! No kidding, it's 10 mins. The eel is already cooked. thank you very much for always sharing us how to cook all these palatable dishes. Wonder how long does it take if I use the fresh eel and is there any more or different steps involved? Thanks!! I didn't try using fresh eel to make this dish. The eel meat is not too thick so it won't take too long to be cooked through.